Artem Sharoshkin, co-owner of The Boxing Club in East Village, says the club is not limited to boxing. It provides state-of-the-art fitness equipment and other classes such as Pilates. Photo by Jamie Scott Lytle. Artem Sharoshkin wanted something dramatic and different for The Boxing Club in downtown San Diego. “Let’s go crazy with this,” were his instructions to designer Marianne Berg of Mbee Studio. Rows of heavy bags are ready to take some punches at the club. The location alone cries out for something dramatic — the bottom floor of Shift, the 21-story red-and black apartment tower designed to stand out and reflect the bohemian nature of its East Village neighborhood. The Boxing Club also is just down the street from the former Colisium Athletic Club, an old-school boxing venue that has been transformed into the Punch Bowl Social restaurant, which combines dining with social get-togethers and a wide assortment of games from bowling to vintage video games. Adding ground-floor fitness centers where they’re highly visible is a growing trend and a way to attract tenants, especially downtown, said Rachel Parsons, a first vice president of the commercial brokerage firm CBRE in San Diego. Company description: The Boxing Club was created with a belief that fight arts can be an effective and fun platform for overall fitness and health. “I like the whole gym concept on the first floor. It’s very activating. I think we’ll see a lot more of that,” Parsons said. “The Boxing Club is a huge retail tenant for downtown and it’s really exciting that they’re coming to East Village. EMMES Group of Cos. added a Pure Indoor Cycling studio to the first floor of its 1 Columbia Place building two years ago to help attract tenants, said Christine Takara, EMMES director of marketing and customers’ experience. In designing The Boxing Club, Berg took Sharoshkin’s admonition to “go crazy,” and ran with it, starting with the crystal chandelier hanging above the reception desk at the front door and a second crystal chandelier over the main boxing ring at the center of the club. Turn to the right, and there’s a giant mural of Muhammad Ali by local street artists Kyle Boatwright and Kelcey Fisher taking up an entire wall. 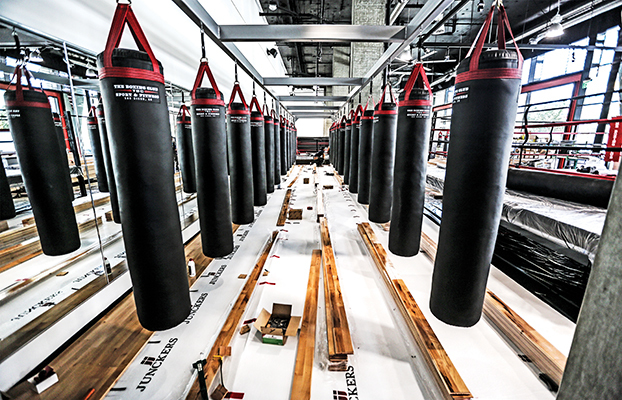 Around the corner is the heart of the club — a 10,000 square foot room with a 22-foot-tall ceiling and with a regulation size boxing ring at the center.